Last Sunday my 9 year-old son and I attended the Vancouver Mini Maker Faire. Seiji, a child of the new millennium, was relatively non-plussed by the 3D printers, laser cutters and robots. He’s been to STEM camp. He’s designed his own toys in TinkerCad. He’s 3D printed things on our PrintrBot. For today’s engineering-minded YouTube generation, these are familiar technologies. 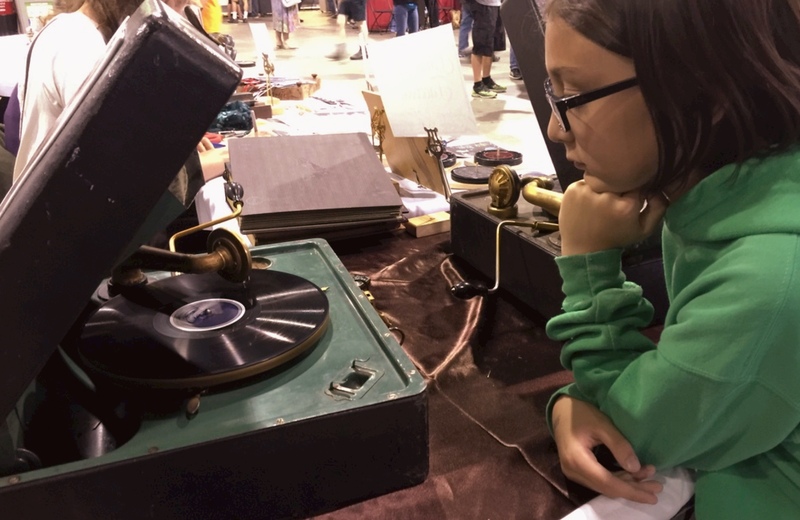 No, what drew Seiji’s attention at the Maker Faire was this old “portable” wind-up phonograph. Of course I can’t fully appreciate what this meant to him. It probably seemed like magic – a featureless black disk spinning under a fine needle to create recognizable music. For Seiji’s generation, music comes out of iPhones, iPods … or just by clicking a virtual button on a software interface. What is going through this child’s mind? This phonograph is probably almost a hundred years old … and yet the electric record players of my mid-70s youth have more in common with this curiosity than the digital music players that Seiji is growing up with in 2016. I was reminded that the way in which he consumes media is – for good or bad – totally different from what I experienced. It is one of the great joys of parenthood to see familiar things anew through the eyes of a child. Maybe its time to reverse this, buy a turntable, and sit Seiji down to listen to the entirety of The Wall or Led Zeppelin III.